Nothing is more rewarding than getting both of your twins down to sleep at the same time. You tiptoe out of the room, congratulate yourself, and kick back to relax. Then the worry sets in. Are the twins both asleep? Are they safely positioned in the middle of the crib? You’d like to peek in, but if your twins are anything like mine (very light sleepers), even the slightest disturbance risks waking them up. If only there were some magical way to monitor both of your twins while they sleep. Luckily, there is. Two of the best video baby monitors now have additional camera capability, letting you monitor two or more babies at once. Here, I compare their features in detail and describe how to set them up to monitor your twins. Real time video and sound to let you monitor your little ones as they sleep or check on them when they’re fussing. Infrared night vision so that you can see your baby even when it’s dark in the nursery. 2.4 GHz FHSS wireless technology with data encryption provides a strong, private signal for the video and sound from your monitor. Two-way communication, so you can hear your twins’ cries and reassure them with your voice if they wake up. 5 built-in lullabies that you can trigger remotely to help soothe a woken baby back to sleep. Remote room temperature reading tells you if it’s too warm or too cold in the nursery. There are more than 240 reviews on Amazon of this monitor and most of those reviewers gave it 5 stars. People love the night vision, the remote pan and zoom, and the two-way audio. With an inexpensive audio visual cable, you can hook the receiver up to your television. I own Motorola 2-way radios myself (they use the same FHSS technology), and it provides a very clear encrypted signal that only Motorola devices can pick up. Overall this video monitor is top of the line. 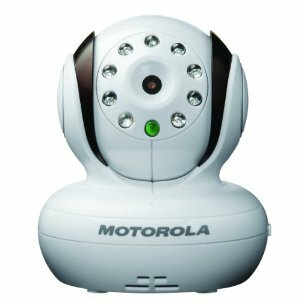 The Motorola MBP36S also is equipped to work with additional cameras; it supports up to four of them. This lets you monitor your little ones from different angles, your twins in different cribs, or even another child sleeping in a different room, all from the color LCD screen. Like the original camera, you can pan, tilt, and zoom extra cameras once you set them up. To view the feeds, you can set the LCD to either scroll through all of the cameras, or else you can choose a specific camera. This is a nice feature if you want to flip between “monitoring” and looking in on a particular little one. You know in the movies where the FBI zips through all of the security footage to find what they’re looking for? Yeah, it’s like that. Infrared night vision auto-sensed by 8 LEDs. 2.4 GHz digital wireless transmission, giving you a static-free range of up to 150 feet. The parent unit is pretty nice – it lets you control zoom and has a split-screen operation mode for when you have multiple cameras. 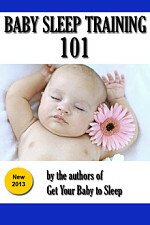 You can also check the nursery temperature, play lullabies, and talk to your baby with it. There are 180+ reviews on Wal-mart and it gets 4/5 stars, so people are pretty happy with it. If you want a video monitor but can’t spring for the Motorola, this is the way to go. You can add up to four additional cameras to your Vtech Safe & Sound monitor, and its split-screen capability makes it easier to monitor more than one. 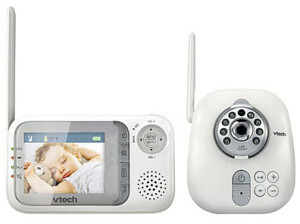 Or you can buy the Vtech twin video monitor bundle, which comes with one parent unit and two cameras. 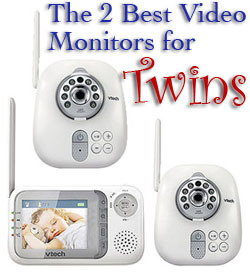 Video Monitors for Twins: Are they worth it? It lets you watch your babies more closely without disturbing them. The peace of mind is priceless. You can see which twin is fussing and make an “action plan” before entering the room. The video feed lets you figure out the problem – is it just soft fussing that will self-resolve? Or is the baby standing at the crib crying? Two-way audio and push-to-play lullabies make it possible for you to soothe those babies without going in. Will it work every time? Of course not. But one time out of five is a big, big deal.